Laser printing in stainless steel – from Excel! I love the connection between abstract computing and the real world. I've had this fascination ever since 1986 when I built circuits to sample sound using an Atari 800. Plugging stuff together is what invention and integration are all about. My buddy Matt and I are building some horn loudspeakers with a difference. These are based on the Cornu / Poiram design which mounts four concentric spiral logarithmic horns behind a single loudspeaker driver. This design means you get small, wall-hanging speakers with great sound. I first heard about this design from FullRangeDriver.com who have lots of committed speaker enthusiasts. We are using Fostex FE108 drivers, supplied from Madisound who were cheaper to buy direct from the US than in Australia. Our speakers will be similar to the above, ie 650mm square and 150mm deep, so they can be wall mounted. Our internal spirals will be 2mm polycarb (Poiram seems to use aluminium!) which fits into tracks cut into the wood. You can't just put any old horns together -- the length, mouth and throat size need to be calculated to match the loudspeaker. We used the excellent HORNRESP from David McBean to do this. Initially we tried to create the speakers by hand, using a home-made metal arm to cut spirals into timber with a router. Matt devised a geometric way to plot spirals using a compass but with a router attached in place of a pencil! The compass was a smart idea but it proved very slow work and we broke some router bits in the process (cheap tools waste time). We didn't like the inaccuracy and realised we needed to cut 128 arcs for one pair of speakers - very tedious. I spent many hours creating a spreadsheet and after four major revisions we had 7000 points of data describing the progression of a 2.4 metre spiral in millimetres. The great thing about Excel was being able to verify the appearance of the spiral by simply charting it (see below). 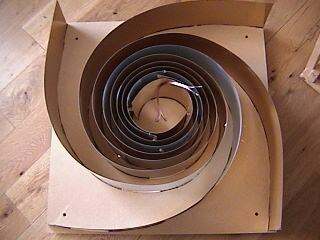 It was easy to check the length of the spiral and its ability to fit inside a 650mm square. Another reason we abaondoned the compass method above was because it was only capable of producing a spiral with a single expansion coefficient, whereas using a spreadsheet allows us to produce spirals that increase in radius with any logarithmic coefficient we like. Excel's goal-seek and solver add-in tools were critical in managing several parameters at once - the growing spiral length, the moving angle, the number of turns of the spiral, the box size. Try doing this on your own and it does your head in! We then exported the Excel data into RibbonSoft's qCAD, a cheap and capable 2d CAD tool ($40 AUD). Matt exported our plot data as CSV and turned it into LINETO(x,y) instructions using a FOR statement in a cmd shell! These instructions were then consumed by qCAD and we exported the result into DXF format (AutoCAD R12) and sent it to a local laser cutting shop (ComputerCut). Now THAT'S what I call laser printing! I reckon you could get seriously addicted to doing this! We made two of these templates, one for a 650mm box and another for an 814mm box (for deeper bass). The next step of the project is to make a 20mm collar to run around the spiral track, which should allow us to guide the router around the timber and cut a very accurate spiral track for our polycarb strips to sit in. We will place the steel template on the timber and cut one spiral, then turn 90 degrees and cut another, until we have four concentric spiral tracks. This should make life much easier, and we can make several pairs of speakers. We have purchased a high quality router bit this time. We will probably continue this project in 2006, I will blog more if it's of interest? Welcome any comments. Sorry there's no code - but I thought it was an interesting use of Excel. Excellent kludge Andy! I’d love to see the spreadsheet data – if only to prove how passion (or stupidity <g>) drives people. Really, good on ya. Love to hear em when done.